Here’s a quick and simple craft for kids that will add a little sparkling magic to your Halloween dress ups – a wizard’s wand! All you need is a thin stick, some paint and some glitter. 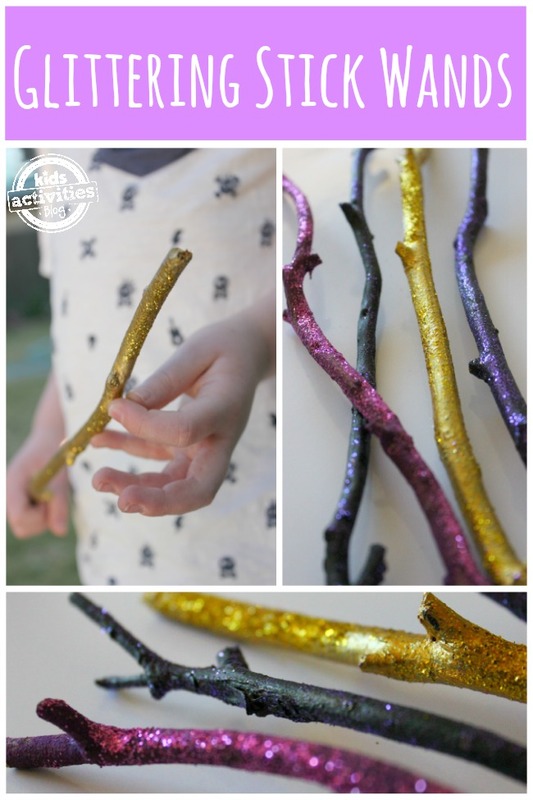 In less than fifteen minutes you can make your own glittering wand – perfect for little witches and wizards this Halloween. 1. Collect some sticks from your yard or on a nature walk. If they are particularly long, break them down to the size you want. It is great if you can find sticks that are bendy and have lots of character to them. It just adds that something special to the overall look of the wand. 2. Next, choose your paint color and paint the entire stick. Gold looks especially magical but any color looks great. 3. Finally, sprinkle glitter over the entire stick. 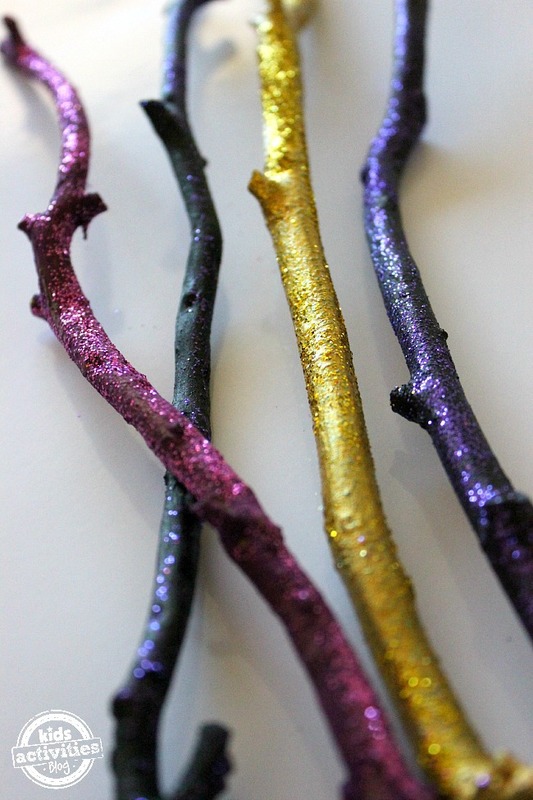 Do this while the paint is still wet so that the glitter will adhere to the stick and you won’t need to use glue. Wait for your wand to dry and that’s it! A magical witch or wizard wand, perfect for imaginative play and dressing up on Halloween. We like how these wands look just as they are, but if you really wanted to make them even more special then you could add some stickers or confetti. Lengths of bright ribbon tied to one end of the wand would also look pretty special, as would the addition of a carboard star or even some bells threaded on to the ribbon. These would also be a great gift for kids to make for their friends. What a special party favor these would be at a fairy birthday party or kids’ Halloween party. They suit both boys and girls and will lead to lots of imaginative play! Those wands look amazing. I especially love the one that is black with purple glitter. I’ll have to keep this idea saved in my mind in case my kids ever want to be a wizard for Halloween. Even though I’m a glitter-phobe, I have to admit that those are beautiful! Thanks for sharing at After School. Ha! In a house with all boys, I need a bit more glitter in my life! This is a great craft for any time of the year! Thanks for sharing it with Afterschool! So pretty! We may have to do this or something like it! Thanks for sharing at Mom’s Library! Thank you for linking up this idea to ‘Share It Saturday’. I look forward to featuring it this weekend. Hopefully you will be able to link up more of your brilliant ideas. What a creative way to use nature around us for Halloween costumes (or when watching one of the Harry Potter films 🙂 ). Thank you for sharing and for linking up this week to the Thoughtful Spot Weekly Blog Hop.